Michael McFadyen's Scuba Diving - Hino Maru No 2 The Hino Maru No 2 was launched on 16 September 1935 from the Mitsubishi Jukogyo KK (Mitsubishi Heavy Industries) at Kobe for Nippon Shokuen K. K. She was powered by a single six cylinder Mitsubishi diesel engine. A cargo ship, she entered service on 14 December 1935. The new ship was not real big, only 999 tons gross (later rated as 977 tons) and 61 metres (200.1 feet) long and almost 11 metres (35.1 feet) wide. It has many alternative names, including One-Gun-Boat, Gun High Wreck (both for obvious reasons that will be detailed later), Dai-ni Hino Maru, Dai-Futa Hino Maru and sometimes Tenno Maru. It is certainly not the Tenno Maru which is, in fact, the Hikawa Maru No 2. Dan Bailey in his book WII Wrecks of the Kwajalein and Truk Lagoon claims that the the Gun High Wreck is not the Hino Maru No 2 but he seems to contradict himself (see pages 143 verses 147-8). The Hino Maru No 2 was used as a gunboat during the war but I do not have further details. In any case, the ship appears to have been anchored on the western side of Uman Island in Chuuk Lagoon, a few hundred metres to the north of the Sankisan Maru, on 1 May 1944 during the second carrier raids (12 US aircraft carriers attacked over the two days of 30 April and 1 May 1944). It is reported that it was damaged by a 500lb bomb at about 1445 hours. Today the wreck of the Hino Maru No 2 lies with the bow in less than three metres. 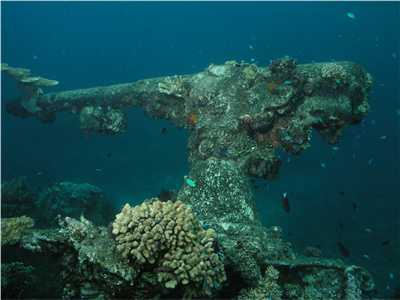 The ship is very badly damaged, in fact, the most broken up of any of the wrecks I have dived on in Chuuk Lagoon. It is normally done as a snorkel and that is about all it is worth. The dive boats anchor near the bow and the first thing you will see is the bow gun. This will give you a good idea why it was called the Gun High Wreck. This presents an excellent photographic opportunity. Even this section of the wreck is utterly devastated. The anchor chain and winch are still recognisable and you can swim down into the forecastle area. Behind this there are the remains of hold one and hold two. There are bits of hull, some hold partitions, masts and other parts of the ship but it is a big mess. This is about all there is to see. Again, do not give up a dive on another wreck but spend a few minutes to snorkel it on the way to the Sankisan Maru.